Set up like most celebrity "memoirs" as a collection of essays on any number of topics, most filtering back to a discussion of fame and beginnings, Kendrick appears to be the same intelligent, spunky woman we've come to know on the silver screen. As I listened to the audiobook (that she narrates) I could definitely see the girl behind the character and how elements of her personality seeped through in different film rolls. 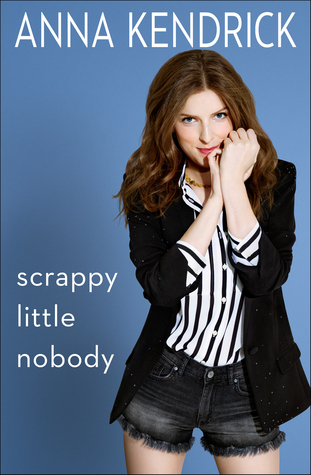 Like Lauren Graham's Talking as Fast as I Can, I didn't know a whole lot about the Anna Kendrick before tackling the book. I can't tell you how many Facebook posts I've come across talking about her wit and "relatability" on Twitter, but outside of the few times I was bored enough to click on the links to see what she was saying, my familiarity with her was pretty slim. Where I came away from Talking as Fast as I Can really liking Lauren Graham, I didn't have quite the same reaction to Anna. She seems like a very lovely person, super talented, and full of wit, but I'm not sure I'd always get her sense of humor :) In fact, there were several times I thought to myself that I would probably do that awkward chuckle around her that you do when you don't really get the joke but you don't want anyone to know that you didn't. (If you have no idea what I'm talking about, we should hang out for awhile so that you can see it in action). It's amazing how young she was when her talent was discovered, and the sacrifices her family made to allow her to follow her dreams. There's definitely an appreciation for someone willing to stick with acting through the rough years when jobs aren't plentiful. She also gives an interesting snapshot of the reality of celebrity and finally being noticed. Those where the moments I think I enjoyed most in the book. Overall, a fun book to read made better in the author's own voice. In fact, it's kind of hard to imagine not listening to a memoir when the celebrity reads it themselves. I think there would be something missing in print. Not a bad way to kick off the memoirs on my 2017 reading list!